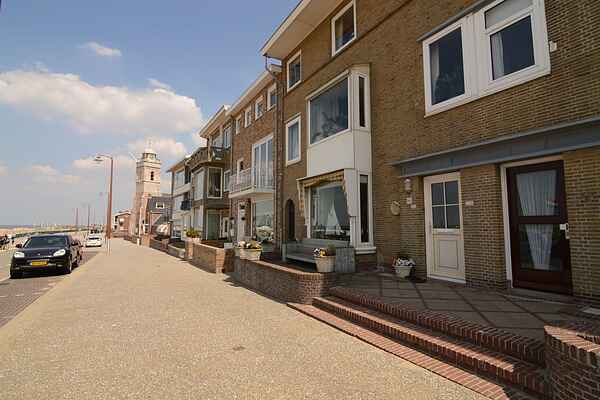 Charming holiday home for 5 people, directly on the boulevard of Katwijk by the sea. This holiday home can be found on the boulevard of the cozy city of Katwijk. 'T Juttershuys is a well-kept apartment where the dog is also very welcome. The living room is spacious and light and offers views of the North Sea from the window. The ground floor has 3 connecting rooms to separate by sliding doors with stained glass. Attached to the dining room is a conservatory with two single beds. Downstairs in the basement are the other bedrooms. The entire house is decorated with a cozy maritime theme. At the house you will find a sheltered courtyard where you can sit and enjoy the evening with BBQ. The holiday home serves as an ideal starting point for a nice week or weekend away by the sea. You put on your swimwear, cross the boulevard and the beach fun can start immediately! Furthermore Katwijk is very favorable for a visit to Amsterdam (55 km), The Hague (23 km) and historic Leiden (10 km). At a short distance you can rent bikes to easily discover the surrounding area and cycle along the boulevard. Spring:At Spring time you have to drive between the famous Dutch fields with flowering Tulips, hyacinths and narcissus.The colours buit even the smell are gorgeous.Just about 15 minutes by car in direction off Lisse. Leiden is the next city after Katwijk aan zee. This city also contents just like Amsterdam lots off channels with cosy outdoor terraces and yes you can book a trip on these channels. Here you will find also the oldest university of the Netherlands (1575,founded by Willem van Orange)Leiden is because of international reputation always a life, winter or summer.You also find in Leiden a lot off beautiful musea with all kind of temporary and permanent exhibitions.. like the real amazing museum of natural history"Naturalis" with huge complete rebuild skelets from real dinosaur. Or just out of the border of Katwijk (just Leiden /Oegstgeest)the exiting travel trough human body at museum "Corpus ".If you love (like we do the Dutch musea, maybe a card for a year is an option so you have free access to a lot,check out yourself) www.museumkaart.nl -search and you will find all ! From the road A4 exit Oegstgeest you can see this wonderful museum rising up from the landscape as a human body in steel. This is the most successful Dutch musical ever ,sold out for more than 7 years ,so take your change to combine this with your stay in "t Juttershuijs"just 15 minutes by car from this location. Honestly I can talk hours about everything just around (true!) and you like to come to the beach for a walk or a swim ...You are just in the middle of nature and culture ..the perfect location for a long or short break or discovery of the Netherlands in a wide perspective.